Contact – The 60th Battalion C.E.F. 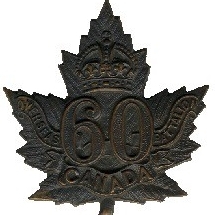 "Victoria Rifles of Canada"
Do you have commens about this site? Suggestions to help me improve it? Do you have information on a member of the 60th Battalion? Drop me a line, Photos are always welcome. Do you have a question about the 60th? I would be happy to answer if I can.